The Play to Your Health Program! The quality of the class is most dependent on the coaches who teach them. Play to Your Health youth fitness professionals have real experience working with children in sports and exercise. All coaches meet our high standards for patience, classroom control, and positive attitude. We are prepared for everything and truly care about providing the best for our students! Agility is the ability to change the body's position efficiently, and requires the integration of isolated movement skills using a combination fo balance, coordination, speed, reflexes, strength, and endurance. The Play To Your Health program incorporates agility training in fun and effective ways. Balance is the foundation of athletic coordination. Training for good balance increases athletic performance and significantly reduces risk of injuries. The Play To Your Health program incorporates balance training in a fun and rewarding way using obstacle courses, slack line, gymnastics skills, indo-boards, balance boards, surf simulation, dance, and much more. Our introduction to baseball leaves players with a great first impression of the sport. Our creative training methods increase players' baseball skills while having a great time! Our introduction to basketball leaves players with a great first impression of the sport. Our creative training methods increase players' basketball skills while having a great time! Board sports continue to soar, and we want to make sure our students have the fundamentals required to give them a go! In addition to our extensive balance training, we use board sport training equipment to teach introduction to tricks! Climbing increases total body strength and control. In the Play to Your Health obstacle vault we have several climbing challenges that really show students what they are made of. Each one can be modified for all abilities. Not everyone will admit to enjoying dance, but with so many styles and interpretations we are not buying it! Play to Your Health incorporates music and dance in a variety of ways, from learning cool hip hop moves to simply moving to the beat. Fine motor movement training adds an extra challenge to more physical exercises. Students practice their ability to control their movements. Play To Your Health models our flexibility training after gymnastics and sports programs. Each class stretch routine is planned according to the days activities. This prevents injuries and increases students athletic abilities. Students are taught how to stretch properly and encouraged to do so in their daily life. Free running or parkour is a new sport described as moving through your environment with out limitations. Simply put it means running around using gymnastics influenced moves. We incorporate some of these moves in exercises to promote body awareness. All the fun, none of the danger. Our introduction to football leaves players with a great first impression of the sport. Our creative training methods increases players' football skills with a great time! The only golf class that guarantees a sweat. Play To Your Health's golf program brings the links to you. 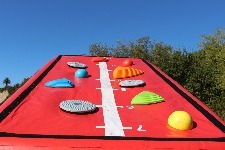 The putting green, mini golf obstacles, driving nets, and more. Gymnastics is the root of the Play To Your Health program. No sport teaches body awareness like gymnastics. We strive to bring more equipment to our school then any other program, to ensure our students are receiving the best basic gymnastics instruction. Class themes give us the opportunity to teach students about more than just sports and fitness. Example themes include: Space, Animals, and Math! Learning becomes a part of the fun. Our introduction to hockey leaves players with a great first impression of the sport. Our creative training methods increase players' hockey skills with a great time! There is something extra fun about catching and throwing a ball with a tool. We use a variety of lacrosse sticks, from small nets to the real thing. Our creative training methods increase players' lacross skills with a great time! Student love our karate influenced exercises. Working individually on karate skills helps show coaches students' abilities. 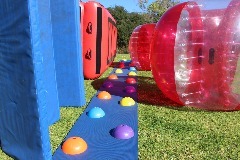 Play to Your Health original obstacle courses are fun and challenging. Inspired by a wide range of sports, gymnastics, and exercises, these courses give students the chance to practice skills solo. Our constantly growing equipment list makes Play To Your Health obstacle courses the best! Play to Your Health original games are influenced by sports, playground games, and exercises. We use a wide varety of fun equipment to enhance our games to the next level. In today's world the advances in video games makes the standard game of "kickball" look boring to some. It is our mission to not stop innovating real world games and sports so every child loves to move. 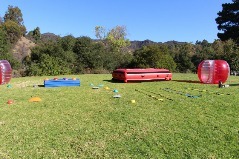 Play To Your Health brings the tables to your school with all the equipment needed to play the game. Combined with more intense athletic training, our Play To Your Health Ping Pong class turns into a serious workout. Catch, throw, run, jump, THINK! Students work their most important muscle, their BRAIN. Problem solving keeps class interesting. Our games and challenges combine physical exercises with thinking exercises. This does not only make students smarter, but often improves students' physical performance by forcing them to let go and just move. Theater/improv games are great way to promote team work and good class energy. Play to Your Health encourages students show their creative talents in many areas of class. Tightrope walking is fun and rewarding.We use slack-lines to gauge improvements in students balance. our introduction to soccer leaves players with a great first impression of the sport. Our creative training methods increases players' soccer skills with a great time! Body weight strength training is a part of every Play To Your Health class. We teach proper form in basic floor exercises. All of our games, challenges, and exercises engage students total body. Students practice throwing and catching balls from a wide variety of sports. In addition to sports balls we use training balls that challenge students hand eye coordination. Play To Your Health classes are supportive, non-intimidating, and non-competitive. Our games give players the chance to work as a team and cheer each other on! We bring the court to you. Our introduction to tennis leaves players with a great first impression of the sport. Our creative training methods increases players' tennis skills with a great time! Our introduction to volleyball leaves players with a great first impression of the sport. Our creative training methods increases players' volleyball skills with a great time! Yoga has the ability to give you an intense workout, loosen your muscles and calm your mind all in one. Being able to stabilize the body and contort into different positions requires a high level of mind-body connection. From a sun-salutation to holding a position on unstable platforms, PTYH yoga takes things to the next level.